Despite having a first class ticket to ride, some of comics best often get left to wonder the platform aimlessly. In Lest We Forget, I pluck a limbo-lingerer from the station and pimp their reason to return. This month, the guy who literally rejected Heaven for love, Zauriel. 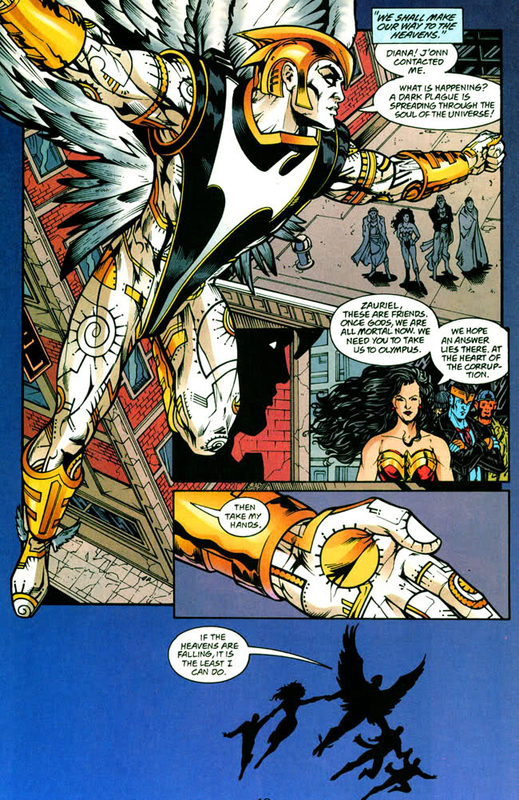 When I first read Zauriel was joining the Justice League as 'the new Hawkman', I hated him immediately. DC didn't need a new Hawkman - with a little work, the one they have is always ready to fly. Yet by the time his debut two issue arc was over, Zauriel not only landed within my top ten characters, he'd brought the forces of hell along with him, and through Aquaman, slipped in an awesome nod to Katar aswell. 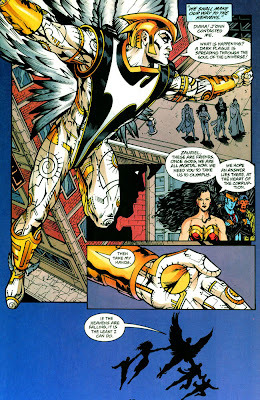 A former member of Heaven's Eagle Host, as a Guardian Angel, Zauriel watched over the likes of Cleopatra and Joan of Arc. Yet it was Californian Shannon Coyne he renounced his divinity for through love, joining the Justice League in repelling Asmodel's army. Since then he's confronted the Spectre, been rejected by his true love, granted a floating HQ over L.A., died a few times and argued for Heaven's aid as they planned for a new creation in the wake of Mageddon. Oh yeah and he's been part of the Shadowpact. As a character, Zauriel's energetic and emotive personality made him almost a bohemian angel (one armed with a flaming sword, armour and angelic scream, but a bohemian no less). In fact he was so hip, he often took God's name in print and no one seemed to complain. 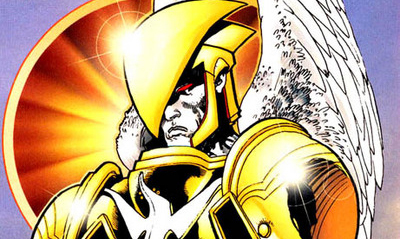 Proving be you Atheist, Christian or numerous other, Zauriel is simply one heavenly creation. HOW I’D BRING ZAURIEL BACK: Zauriel would appear back on earth aware of Pandora and the Phantom Stranger's game, as well as their role in the current state of the DCU. Hunted by forces which would seek to silence his knowledge, Zauriel assembles his own league of mystic and heavenly bodies, ready to confront the forces trifling with mankind. Among those enlisted; Dr Fate, Jim Corrigan and Raven. I definitely agree that Zauriel could come back in top fashion, especially, as you said, since he could very easily be fitted into that ridiculous Trinity of sin/Trinity War storyline. I figured him and Aztec might show up in the new 52 while Morrison was there, but no such luck. Maybe later on they will, but who knows with DC. If they're not immediately thinking of you, or have a very rabid and vocal fan base, you can forget it. Seeing as how you came up with a damn good reason for him showing up, it's any wonder why we're not writing those characters ourselves. The money and fame would be fine, but the hell to working for Dido and his regime. Ive got a Zauriel poster up on my bedroom wall! Been up there for donkeys years, actually. It was from the mini-series featuring the JLA. God, I should take it down, esp as I hope to be moving soon. It begs the question...can a man actually get any action when he has a Zauriel poster on his wall and a dozen Wonder Woman statues dotted around his bedroom? I didnt like how DC tried to bring him up as the 'new Hawkman' [as his origin was so in flux at the time] and always thought hed have been much better off in the pages of Supergirl, which at the time was all about Angels, demons and religious imagery. SUPERGIRL; she's a succubus, you know'. BIZARRO SUPERGIRL' [dumb look] 'she sucked a bus?'. Glad you liked the way I brought hi back to, coming up with those stories is my favourite part of Least We Forget. I would've loved to write comics for a dayjob - but hey, who wouldn't right? PS I stuck the Black Canary image on the Facebook page for you as I didn't have an email address? Hope you could copy it off! @Karl - I have that mini-series! Moving always makes you reconsider what you keep, toss, or hoard. I should know, my stuff went through a sieve when I changed countries! I always thought Zauriel needed to meet Death or Sandman, maybe following on from Sandman's appearance in the JLA, but oddly enough that seemed to go begging. I mean how many people on Earth dream about their version of Heaven? I liked your joke to, as for action with WW statues, I guess almost as much as myself when I have a giant Superman poster on my wall - but hey, who doesn't like Superman? I like your idea Dan, he seems like an interesting character. I hope DC takes the opportunity that the "new 52" thing has provided to bring back some of their forgotten characters like Cole (sp?) the Crystal spinner among others. Personally Pensol, I think that could be one of the saving grace's about the DC52 - if they used it to really dig deep and polish off some back row characters. Just think of it in a Marvel Knights breaking new ground kind of way. It would be awesome. Thanks again for the comments mr! Reading Justice League Dark recently, it occured to me that Zauriel would fit right in that team. Yeah he would wouldn't he? Seems to be right up his alley, and maybe he'd be there due to the team needing a heavenly presence there, or just to mess with Constantine. Hey that would be a great spot for him. What would Deadman do with an actual angel on the team, whose home is the eternal rest he's so long been denied? Yip, we should definitely write for DC guys. Anyone know how to lock Geoff Johns in his multi-winged penthouse for a few months?